MAZ’s origins go back to February 2007. At that time, Marc Maziade was given carte blanche to create a musical project for the Festival Ste-Rose en Blanc. He put together a show called Projet Trad with Olivier Hébert, Louis-Joseph Cliché and Robin Boulianne, who shared his passion for traditional music and jazz. Over the years, Projet Trad got together for various projects (soundtracks for dance or short films, competitions and corporate contracts) with different lineups, including Lévy Bourbonnais, Jean-François Debellefeuille, Gabriel Godbout-Castonguay, Blanche Baillargeon and Philippe Leduc. 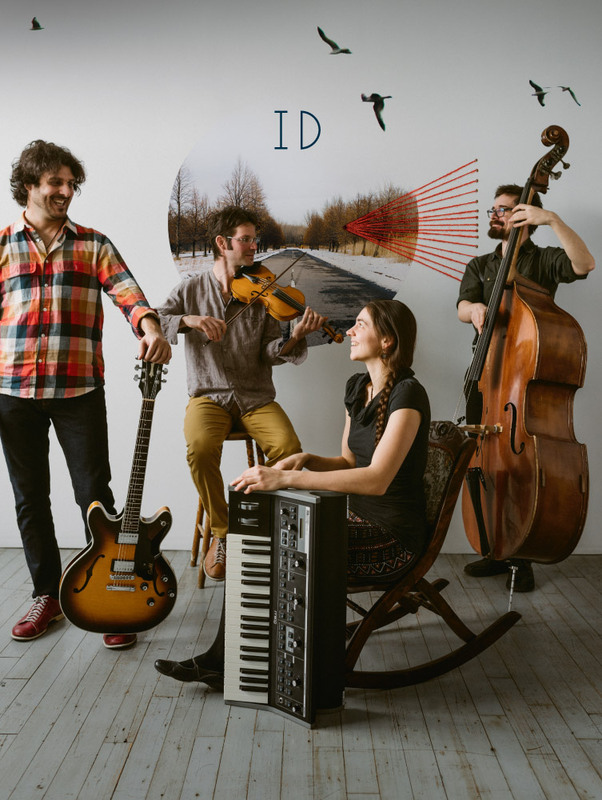 In 2009, Marc Maziade (composition, electric guitar, tenor banjo and foot percussion) officially established the group MAZ and in 2011 launched the album Télescope with Robin Boulianne (composition, violin, mandolin, foot percussion), Olivier Hébert (bass), Gabriel Godbout-Castonguay (keyboards) and Jean-François Debellefeuille (Rhodes, Wurlitzer and Moog). In 2011, the band toured Telescope from Carleton to Vancouver, from Petit Fribourg in St-Jean-Port-Joli to the Folk Alliance International in Memphis, before placing us in one of the strongholds of traditional Québécois music, the town of Joliette for the recording of our second album: Chasse-Galerie. For MAZ, the legend of the Chasse-Galerie invoked the duality between sincere dreams in which we invest body and soul, and the mirages created by today’s frenetic lifestyle. Society often proposes shortcuts that can make us lose sight of what’s essential to our happiness. You need a fine sense of balance to fly a canoe. By soaring on favourable winds while avoiding the traps of appearances, it’s possible to pursue our quests without losing our roots.